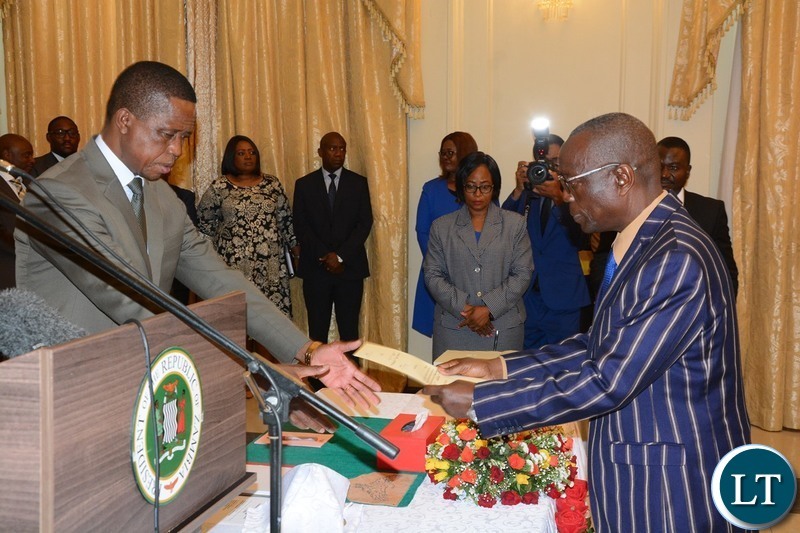 President Edgar Lungu has cautioned permanent secretaries against undermining the authority of Cabinet ministers in the discharge of their duties. 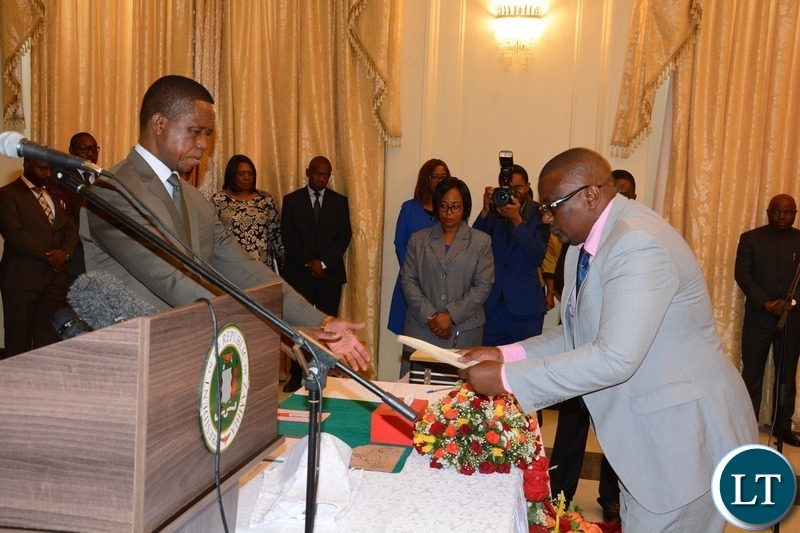 President Lungu said he will not tolerate any more continued friction between ministers and permanent secretaries. 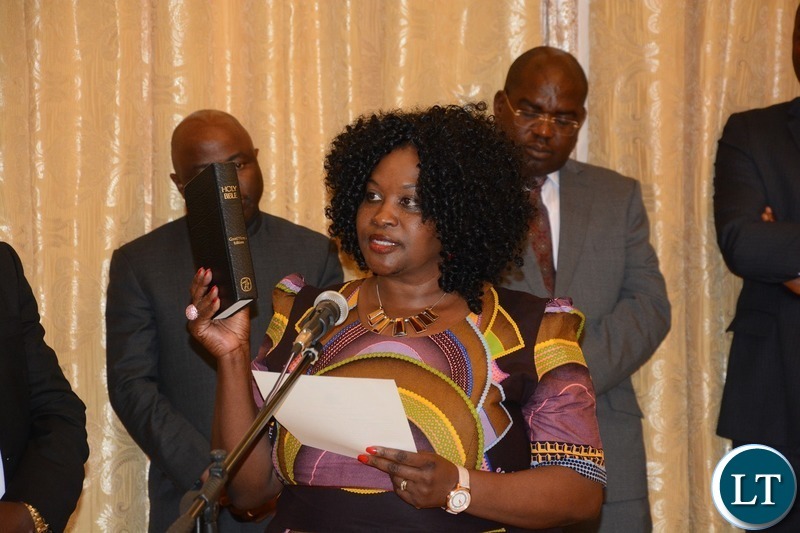 The Head of State issued the directive in Lusaka today when he swore in four newly promoted permanent secretaries. 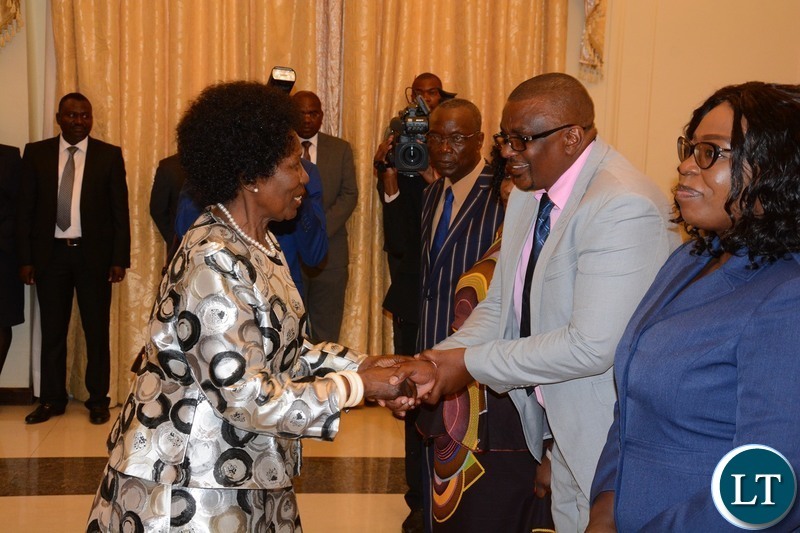 Those sworn in are Ministry of Health permanent secretary for Administration Mulalelo Kakulubelwa and Muchinga Province Permanent Secretary Joyce Nsamba. Others are Central Province Permanent Secretary Bernard Chomba and his North Western Province counterpart Willies Manjimela. 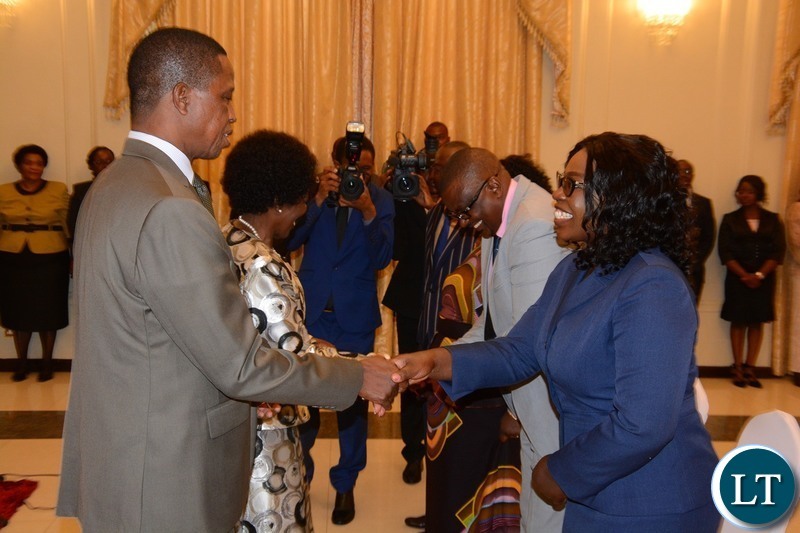 President Lungu noted that in the past he has witnessed challenges of permanent secretaries undermining cabinet ministers and was compelled to counsel them so that they can work together to achieve government developmental targets. “I will not tolerate any more friction between ministers and PSs because they are two sides of the same coin” said President Lungu. The Head of State stressed that permanent secretaries should not think that they are bigger than ministers. He stated that the roles of ministers and permanent secretaries are well defined and that it is paramount that they all work together to achieve and deliver on the promises the PF made to the Zambian people. The president expressed confidence that the newly promoted and sworn in permanent secretaries have amassed sufficient knowledge and expertise to function and discharge their duties due to their long service in the civil service. President Lungu said he expects ministers and permanent secretaries to drive the various government development as enshrined in the PF manifesto and the 7NDP in order to improve the welfare of Zambians. He warned that he will not hesitate to fire Cabinet ministers failing to perform and permanent secretaries antagonizing the work of Cabinet ministers. President Lungu said he will not allow ministers and permanent secretaries to cost him his job at the hands of the Zambian people but that they should instead dig deeper and serve the Zambian citizenry or risk being fired. “I will not give you latitude to mess around and cost me in 2021, I would rather sack you now and give the job to people who can do the job, “said President Lungu. Newly sworn in ministry of health permanent secretary in charge of administration Mulalelo Kakulubelwa pledged to work towards promoting universal access to health in the country. Muchinga Province Permanent Secretary Joyce Nsamba said she will ensure that Muchinga develops side by side with other provinces. Central Province Permanent Secretary Bernard Chomba pledged to continue developing the province by attracting investments to the region. North Western Province permanent Secretary Willies Manjimela said he will work towards cementing unity in the region and maximizing the province’s natural resources to bring development to the area. And Special Assistant to President Lungu for Press and Public Relation Amos Chanda has announced that permanent secretary for ministry of agriculture Patrick Shawa’s contract will not be renewed when it expires at the end of January this year. Mr Chanda said President Lungu will appoint a new permanent secretary for the ministry of agriculture in due course. He clarified that Dr Kennedy Malama will take up the portfolio of Ministry of Health permanent secretary for technical services previously held by Jabbin Mulwanda who has been sent to Cabinet Office for holding. They look humble, like how civil servants supposed to look. But with those demands of 2021 elections, sounds like: “mess around, you have only up to 2021”. It’s unfair to have Bishop Chomba continue as Permanent Secretary of any ministry. Only that we don’t know the family relationship with Ba Edgar. Now even chaps like Willies Mangimela dressed like your Garden boy on first Friday nite after payday going to the chibuku tavern to impress the komboni women…in KK’s era he would have been turned away by OP security guards!! That’s lazy lungu for you cautioning civil servants not to undermine his empty tin ministers who are busy drinking and driving on Friday nite and writing off GRZ vehicles…you have not said a word..my my how I miss one Old man Sata he would have fired a warning shot. I was saddened to find out that a close friend’s cancer has spread and that she will need to undergo a PET Scan in South Africa to understand the extent. The cost of the test there is $2,000 which she is in a struggle to raise. I can’t understand why the entire Zambia can’t get even one scanning machine. My online search revealed an entry level machine costs between $1.5m and $2m. Surely this should be a greater priority than some of the questionable purchases that have been made recently? This is what I always talk about …who spent thousands of dollars on a routine medical check in RSA last week and spent 8 days relaxing. Ba Kaonde ba PS Mangimela..? awe sure.. / This is Mrs. Naomi Tetamanshimba Khumalo’s uncle. Our UPND talkative sister. Its called a gabardine gabardine old school attire. 3 permanent secretaries at Health?why? I doubt that man is a seasoned Civil Servant as he would have been cautioned by his supervisors not to dress like a 90s Rumba musician in the office. The man inspired the choice of the new ZRA uniform . . . . .a simple black pants and sky blue/white shirt can do for ZRA uniform! What does PS have to do with 2021 elections!!! Ili li crook li Vodka ka? Unbelievable, how you warn permanent Secretaries about 2021 elections. Let there be fair elections. Enough is enough, you have failed to rule! I hate it when the president talks about 2021. Ba President leadership is not about the next election. Its about the next generation. For now you must focus on creating jobs for the youth and building the nation. PErmanent Secretaries and 2021 elections.Permanent secretaries are campaign agents. These are Lazy Lungu wasted years ..everything is comedy at the expense of taxpayers!! Lewis Mangimela needs to be arrested for crimes against fashion. I can imagine such a man as your boss, it must be hard. ECL is always on point fashion wise why cant he learn from his boss. ECL is always on point fashion wise ? How come not a single inch of his shirt sleeves are not sticking out of his jacket sleeves as per the norm. Wife lets her husband go to work dressed like a clown!! Salaula from China , yet again he will soon be well dressed as soon as he comes across zambia’s tax payers money. Go boy !! Lungu thinks what his doing currently is pleasing the Zambian people hahahaha. Whats the dress code for state house functions like the one we are witnessing here kanshi???? Look the woman dressed with picture of a mask on her belly. This is disaster. That man in striped suit looks more like a caterpillar. That game ranger uniform we were laughing at all the way kikikiikiii!!!! for ZAWA!!! #2.1 Jay Gay, trib.al are you illiterate? Dr Kennedy Malama who was PS Administration at MoH has been moved to replace Dr Janbin Mulwanda as PS Technical Services MoH. The lady Caroline Kakulubelwa has replaced Dr Malama. Two PSs at MoH as before. Is that difficult to read? Trib.al Jay Gay, you never to disappoint, amaze, shock me with your trib.al thinking. What I did not know until now is that you are also illiterate and only able to read trib.al language. Wonders shall never end as long as trib.als roam our streets! What this got to do with tribalism…when are you going to grow up? You are a grown man who is always regurgitating the same thing. Yes, I haven’t read the article as I can not be bothered …what new things am I going to learn from a dull lazy Politician warning civil servants about General elections as if they work for him. You fail to post a comment on here without referring to me or have tribalism in the subject…why do you come on this website? You are so twisted and dull-witted that you even chose a name you are now stuck with as your initial scheme was to try to masquerade as an opposition blogger now you are stuck with the alias. I for one wouldn’t miss a dimwit who contributes nothing to the website..just go and drink Chibuku silly boy!! Very unnecessary and unfortunate comments from ECL. Those are civil servants in the first place. What’s with all this continued politicization of every fabric of Zambian society? He is only thinking about himself. He thinks he is the only one who should continue in 2021. You are not fit to be in that position currently, let alone 2021. Where’s the permanent secretary for cleaning our filthy urban centers so that Lungu doesn’t have to chip in all the time? Put the zebra suit man in charge of monthly cleanup exercises. #10.1 Jay Gay, now that is why you are nothing but a trib.al. How can you comment on something that you have not read? That is typical of TRIB.ALS…. Me a dimwit? Certainly far better than being an illiterate TRIB.AL! ???? His Excellency The President, omitted to caution the new appointees against corruption. Jay Gay TRIB.AL, please read this before you comment, it’s in simple twelve word grammar. Please leave me out of your silly posts …I have no time for you, your retrogressive posts and your folly, just ignore me. Your friend Kudos Bonehead has got the message and ignores me now…let’s see you just contribute to the topic at hand if you can’t do that DONT JUST COMMENT!!!!!!!!!! Good morning Jay Gay trib.al, you said that you don’t read didn’t you? My advice is that if you don’t read, don’t comment. Okay trib.al? Maybe transfer yourself to Zamwatchdogs, for I will not leave this site any time soon. Certainly not to leave it in the hands of trib.als and purveyors of unresearched comments like yourself! His preoccupation is 2021. He warned Judges and he went away with it. Today he is sending a signal to his cadres through PSs indicating that he shouldn’t be challenged at the conversion. What a crown running away from press conferences. Ok but to be frank those who see any semblance of leadership qualities in Lungu have to be urgently assessed with respect to their mental faculties. All economic indicators are in bloody reverse!! What is it about this clown that you see?? If you are direct beneficiaries then its fine you are sane but if you do not benefit directly and still cheer this visionless clown on, you are not only insane but extremely dull. What a suit from Mangimela….. Sata would have sent him back to Solwezi to get well dressed. He is an embarrasment to the Kaondes. This President just thinks of retaining Power. Remember and imagine that just after being ‘elected’ in 2016 before doing any work at all, he started talking about 2021. Does he have any advisors at all? This man why this dressing next time his Excellence must consider this important one. What a suit! The man in stripes will be CEO of NWP. Is the President telling us something about NWP by appointing that Mangimela man? He looks like a village lawyer. Maybe the whole state house exercise was part of circus rehearsals. The president is saying that his election in 2021 will be determined by performance NOW. He is simply saying IF he doesn’t win then it will be a result of performance NOW. What’s rocket science about that? He is saying he has to earn 2021. Why are your leaders allowed to aspire and ours not? Your are powered by hatred. That doesnt mean I like Mangimela swagg. The guy has no sense of fashion. I would fire him same day. One dead man in the grave has lost a suit! Is it constitutional for a president of Zambia to go beyond 10 years in power? Aren’t these swearing ceremonies just a waste of time and money? Why can’t a person just be appointed and given his/her responsibilities and a code of conduct on a paper as they sign their contracts? Why do we want to hold ceremonies on a daily basis in the name of swearing in? We waste time, a lot of it. The president can use this time to work on improving the economy. 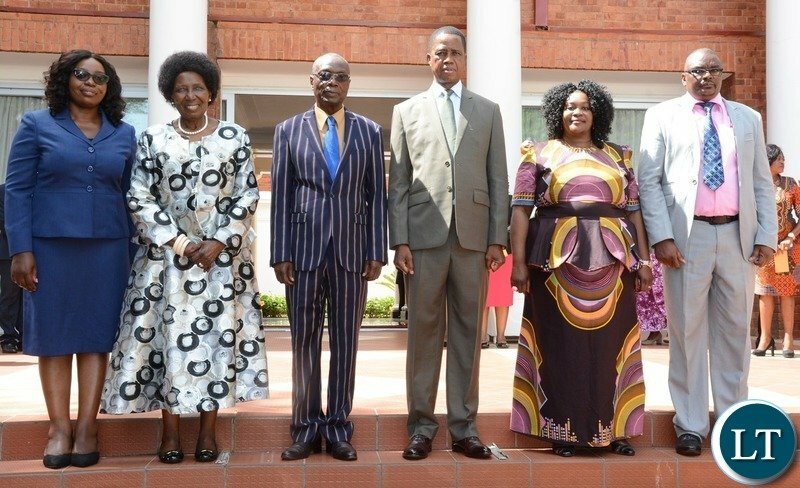 But Permanent Secretary North Western Willies Mangimela also, who wears a suit like that for a swearing in ceremony, the chap looks like a clown at a circus party. Look at their boss Lungu also, he looks like he wants to dance “Vimbuza”, sooo ridiculous, mambala uyu! Newly Appointed Permanent Secretary Ministry of Health Kakulubelwe Caroline can smile.